The chart on your left was sent out to subscribers of Michael’s precious metals letter on February 3 and illustrates his brilliant work so well. My confidence in Michael’s momentum-based work has grown as I have seen how time and time Michael’s momentum/structural analyses are more accurate than those of price chart analysts. He gets you in at a lower price and out at a higher price. Now, as you can see in the bottom chart on your left, momentum has broken above the downtrend (green line) giving a clear buy signal. 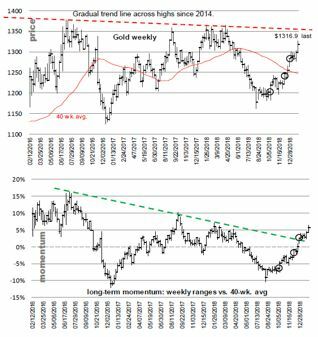 But gold has to rise further (above the red line) on the price chart before most analysts will get buy signal. If this were a once or twice happening, I would shrug it off. But most often whatever the market, Michael gets you in at a lower price and out at a higher price. As Michael pointed out, the breakout over the last momentum structure was achieved as price moved above $1,280 in December. The prior two momentum-based buy levels were just above $1,200 and $1,240. Michael did admit this week, however, that he will likely be wrong in his December 7 report that in the “next fifty trading days” gold would take out price highs of the past five years. At that time, gold was at $1,240. Five-year highs meant taking out $1,392, the 2014 high. Fifty trading days after that report means by February 20. Cash gold closed this week at $1,318, which means we would have to see a $74 price of gold in the next three days. Certainly, that’s not impossible, but the odds suggest it won’t likely happen. If the five-year highs are not taken out this month, Michael says there are simply too many accumulated positive momentum factors for it not to happen very soon, followed by a “whoosh” to much higher levels considerably beyond the 2014 high. In this issue, I commented on most of the significant stories this week. Fremont Gold begins drilling at Gold Bar in Nevada. Genesis Metals released a new resource on its Chevrier Project in Quebec. Balmoral intersected 92.57 meters grading 0.77% Ni on its Grasset Project in Quebec. Newrange Gold demonstrated 97.1% gold recoveries in initial metallurgical tests on its Pamlico Project in Nevada. VR Resources sampled 58.3 g/t and 809 g/t silver on its Clipper Project in Nevada. Metalla acquired a 1% NSR royalty on Atlantic Gold Corp.’s Fifteen Mile Stream Project in Nova Scotia. And Irving acquired two gold projects in Japan and expanded the OMU Project. Among the non-mining stories covered, dynaCERT reported that it received an order from an internationally leading mining company for three of its large engine HydraGEN products for a large Brazilian open-pit project, and Sprott Inc. announced that it will be entering a JV with the Tocqueville Gold Fund. To access these press release links, go to www.MiningStocks.com.